Choose our Crater 1 & Crater 2 ceramic tile patterns when you are looking for a fun design to add to the walls of your upcoming project. When you are picking tile for your home, business, or restaurant, you have the opportunity to select a decorative ceramic tile to make your walls stand out. 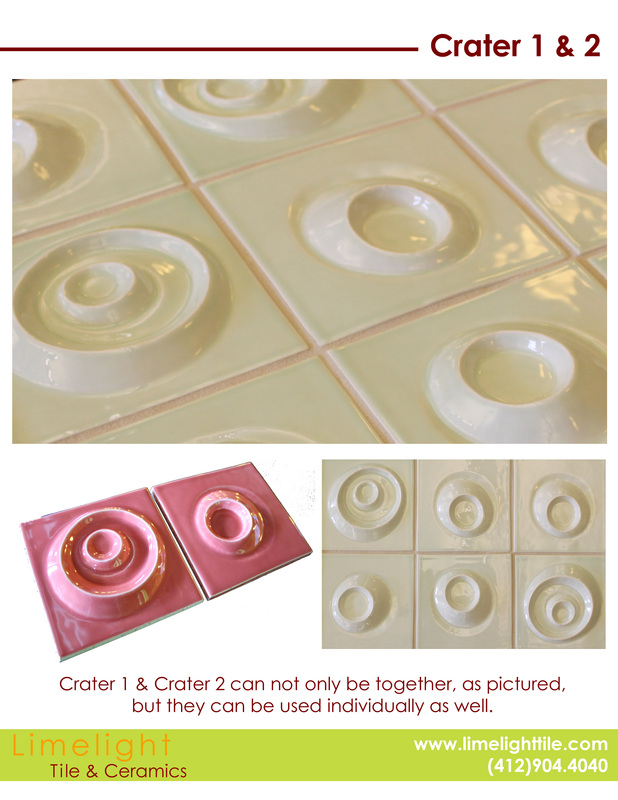 The best part about the Crater 1 & Crater 2 ceramic tiles is that you can decide to use both together or separately. This means you can have an entire wall featuring Crater 1, Crater 2, or Crater 1 & Crater 2. The design possibilities are endless, especially when you factor in our custom colors and glazes that total over 300 options. When you are looking for assistance with custom ceramic tiles, you can trust our team to help you create a tile masterpiece. Call our design team at (412) 904-4040 to set an appointment to discuss ceramic tile patterns.